make sure to read the footnotes!! The theology of the Holy Orthodox Church is a seamless garment that is firmly grounded in the reality of the famous Patristic dictum “For He was made man that we might be made God.” There has been but one true revolution in the history of the world and that is precisely the Incarnation in the flesh of the eternal Logos in the person of the God-man Jesus Christ, whereby the power of sin, corruption, death and the authority of Satan are shattered and the chasm between the uncreated God and His creation is bridged. If the Incarnation is the foundational mystery of the faith then the person of Mary the Theotokos from whom Christ received His flesh and was born also stands at the center of the faith. Thus Fr. Sergius Bulgakov states that “love and veneration of the Virgin is the soul of Orthodox piety, its heart, that which warms and animates its entire body,” and “A faith in Christ which does not include … the veneration of [H]is mother is another faith, another Christianity from that of the Orthodox Church.” Her icons abundantly adorn and her praises are fervently sung in every Orthodox temple and home. Our bishops who bear the heavy Cross of archpastorship also bear the icon of the Panagia who bore her own Cross to a height “more honorable than the Cherubim and more glorious beyond compare than the Seraphim.” She is an image of the Church both as the Mother of God and as our supreme example of human purity and thus she holds such a prominent position in the Church. Panagia is our helper and protector and the Joy of All Who Sorrow. To contemplate Christ it is necessary to contemplate the person of His most pure Mother. However, we do well to heed the words of St. Epiphanius of Cyprus which warn of problems generally seen in Catholic and Protestant faiths: “There is an equal harm in both these heresies, both when men demean the Virgin and when, on the contrary, they glorify her beyond what is proper.” From an Orthodox perspective, Catholicism often lapses into excess devotion and dogmatics concerning the Theotokos, but the Protestants unfortunately generally ignore her, seeing her as a mere vessel whose role is over once Christ is born. In Orthodoxy, she is always integrally connected to her Son, the Lord Jesus Christ. In icons she is always depicted with Christ except in scenes from her life, which are understood to be preparing her for Christ, and when she is depicted praying to Christ. She never seeks for nor accepts glory of her own but always points us to her Son. The Old Testament contains many prophecies, allegories, and typologies concerning the Theotokos, beginning in the book of Genesis. Eve, the virgin who said “no” is seen as a foreshadowing of Mary, the virgin who said “yes,” and Genesis 3:15 prophesies the woman whose seed would crush Satan. There are many others including Jacob’s ladder, Gideon’s dewy fleece, the queen of Psalm 45, and of course the virgin prophesied in Isaiah 7:14, which could all be treated extensively on their own. One important connection expounded by the Church Fathers is that of the Ark of the Covenant and the Mother of God. Although it is not explicitly stated in Scripture, a careful study reveals that it is the undeniable teaching of the Scriptures, and especially of the Gospel of the Evangelist Luke who personally knew the Theotokos, that she is the Ark of the New Covenant. According to the commandment of God, the Ark of the Covenant was made of the rare shittim wood and overlaid with pure gold (Ex. 25:10-11) and in it was contained the word of God on stone – the tablets of the Mosaic Law, a jar of manna, and Aaron’s budded rod which signifies the Jewish priesthood (Heb. 9:4). The spirit and glory of the Lord filled the tent wherein was kept the Ark and overshadowed it (Ex. 40:34-35), and God spoke to the people of Israel from the mercy seat of the Ark (Ex. 25:22). The Theotokos is a woman rare in her obedience to God who was “overlaid” with the pure gold of the Son of God, bearing in her womb the Lord Jesus Christ Who is the Word of God in flesh and the fulfillment of the Law, the bread of life, and the one High Priest Who budded forth from the grave (Matt. 5:17, John 6:35, Heb. 3:1). At the Annunciation she was overshadowed by the power and Spirit of God (Lk. 1:35), and the Word of God comes to us from her. During the reign of Saul the Ark was captured by the Philistines but was returned after seven months. King David retrieved the Ark but fearing the wrath of God he asked, “How shall the ark of the LORD come to me?” and he took it to the hill country of Judah to the house of Obed-Edom the Gittite where it stayed for three months and blessed his house. Later David shouted for joy and danced wearing a priestly ephod in the presence of the Ark as it was being returned to Jerusalem where its glory would be revealed in the newly built Temple (2 Sam. 6). While pregnant with the Lord, the Theotokos traveled to the hill country of Judah (Judea) to the home of her cousin Elizabeth who greeted her with the words: “And whence is this to me, that the mother of my Lord should come to me?” She stayed there for three months and is thrice described as “blessed” by Elizabeth. At the sight of the Theotokos Elizabeth exclaimed with joy, “Blessed art thou among women,” and the babe, St. John the Forerunner, of priestly lineage leapt in her womb at the sound of Mary’s voice. After returning home, Mary traveled to Jerusalem to present Christ, the Son of God, in the Temple. (Luke 1:39-56, 2:21-22). The Biblical typology of Mary as the Ark of the New Covenant illustrates well the Orthodox approach to the Theotokos, of venerating her as she connects to and leads us to her Son. The original Ark contained prefigurements of Christ, and the Virgin contained Christ Himself, Who is God. Thus the Church proclaims her to be the “Theotokos,” meaning the “God-bearer,” a title officially bestowed upon her at the Third Ecumenical Council in 431, although it was already in use long before. The earliest usage of the term is found in Origen’s Commentary on Romans and in St. Dionysius of Alexandria’s epistle to Paul of Samosata, and Blessed Theodoret of Cyrrhus even wrote that the term is of Apostolic origin, but through St. Gregory the Theologian it became the standard of orthodoxy: “If anyone does not believe that Saint Mary is the Mother of God (θεοτόκος), he is severed from the Godhead.” Of course the belief that Mary gave birth to God was already enshrined in the Nicene Creed and had even been taught as early as St. Ignatius of Antioch: “For our God, Jesus Christ, was, according to the appointmentof God, conceived in the womb by Mary, of the seed of David, but by the Holy Ghost.” But lest it be thought that St. Gregory would condemn on the basis of Mary alone, he firmly grounds “Theotokos” in the economy of salvation: “If any introduces the notion of two Sons, one of God the Father, the other of the mother, and discredits the unity and identity, may he lose his part in the adoption promised to those who believe aright … For that which He has not assumed He has not healed; but that which is united to His Godhead is also saved.” The Church proclaims Mary as the Theotokos to safeguard the essential teaching that Christ is both fully man and fully God, united in one hypostasis that dwelt in the womb of Mary. The angel brings the glad tidings of childbearing, but she is concerned with virginity and holds that her integrity should come before the angelic message. She does not refuse to believe the angel; neither does she move away from her convictions. She says: I have given up any contact with man. “How will this happen to me, since I do not know man?” (Lk. 1:34) … if Joseph had taken her to be his wife, for the purpose of having children, why would she have wondered at the announcement of maternity, since she herself would have accepted becoming a mother according to the law of nature? The perpetual virginity of the Theotokos is the teaching of nearly every Church Father, beginning with Clement and Origen of Alexandria, and is affirmed by the Fifth Ecumenical Council in its second and sixth anathemas. Moreover, the term “Ever-Virgin” is used in every Orthodox service and the Church appoints to be read at many feasts of the Theotokos the Ezekiel passage of the eastern gate through which the Messiah passes and which remains closed (43:27-44:4) in which the Church sees a foretelling of the Virgin’s womb remaining closed. Moreover, every icon of the Theotokos depicts her with a star on her head and one on each shoulder which represents her virginity before, during, and after giving birth to Christ. Of course there are those in Christian history and today who deny this impregnable teaching of the Church. Tertullian believed that the “brothers and sisters” of Christ were full-blood relations and that Mary could not have remained a virgin while giving birth to Christ. For him, Christ’s birth necessarily opened her womb. Her virginity during her childbearing will be further addressed. St. Jerome wrote feverishly against the heretic Helvidius who taught the equality of the virginal and married life, both exemplified by the Theotokos. Regarding Matthew 1:18: “before they came together, she was found with child of the Holy Spirit,” St. Jerome explains that although “before” often indicates a consequence it can merely show what was being planned beforehand. Regarding the term “firstborn” as applied to Christ, he responds that to be a first child does not necessitate that others follow after. Numbers 18:15 commands that the firstborn child, the child who opens the womb, be commended to God. Of course a mother did not have to wait for other children before considering her first to be her firstborn. He also refutes Helvidius’ exegesis of Matthew 1:25: “and he did not know her till she had brought forth her firstborn Son,” that “till” demanded that Joseph sexually knew Mary following the birth of Christ. St. John Chrysostom addresses the same verse. Regarding the question of the necessity of this doctrine, it can be shown that the Fathers do find much importance in the teaching. Sts. Athanasius, Cyril of Jerusalem, and Gregory the Theologian among many others see in the Theotokos a sublime example for those celibates who would come after her, and Sts. John Chrysostom and Jerome state that it would have been unbecoming of the righteous Joseph to have carnal relations with the woman who is the temple of God and brought forth in a new and miraculous manner of childbearing. 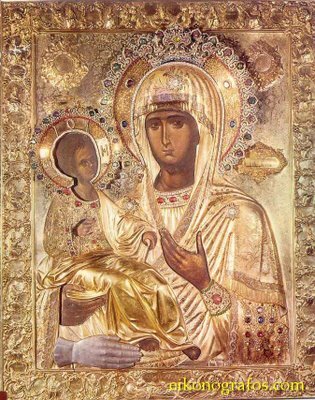 Again, the teaching of Panagia as “Ever-Virgin” preserves her identity as the Ark of the New Covenant which preserves the divinity of her Son and our Lord Jesus Christ. However, it should be noted that this teaching applies not only to her bodily virginity, but even moreso to her spiritual virginity. Archimandrite Vassilios Bakoyannis writes, “It is easier to keep the body purer than the soul. What is required for the latter is life-long, vigilant, humble struggle … the peculiar characteristic of the Virgin, then, isn’t that she remained a virgin in the body, but that for all of her life she was a virgin in the depths of her soul. We denigrate the comeliness of the Virgin if we restrict it to the body.” Thus in all aspects of Christian spiritual warfare the Theotokos stands as our supreme example after Christ. In a certain sense, she alone lived the life of Paradise for she alone is both Virgin and Mother. You have already been told of the unmarried Mother, the fatherless flesh, and the painless childbirth, which was unlike the usual birth with its birthpangs. You should understand that the reason for such pain is quite natural, since any pleasure is linked with pain, and thus it is necessary to take into consideration the connection between the two. It must be understood that if the first does not exist then neither can the second. Whatever is not preceded by pleasure cannot be followed by pain. After all, this is the prophecy of the Prophet. After the transgression pleasure naturally preconditioned the births of all human beings, and no one at all was by nature free from birth subject to the passion associated with this pleasure; rather everyone was requited with sufferings, and subsequent death, as the natural punishment. The way to freedom was hard for all who were tyrannized by unrighteous pleasure and naturally subject to just suffering and to the thoroughly just death accompanying them. In order for unrighteous pleasure, and the thoroughly just death which is its consequence, to be abolished (seeing as suffering humanity has been so pitiably torn asunder by them, with human beings deriving the beginning of their existence from the corruption associated with pleasure, and coming to the end of their life in the corruption of death), and in order for suffering human nature to be set right, it was necessary for an unjust and likewise uncaused suffering and death to be conceived – a death “unjust” in the sense that it by no means followed a life given to passions, and “uncaused” in the sense that it was in no way preceded by pleasure. This truth is also represented in icons of the Nativity which do not depict the Mother of God lying fatigued in childbed, but rather kneeling in worship of her Son. Furthermore, because the Theotokos gave birth as a virgin and without pain and afterbirth, the Church prays to Christ, “By Thy nativity, Thou didst sanctify the Virgin’s womb” in the Kontakion for the feast of the Meeting of the Lord. Not only was she preserved inviolate, but she was even sanctified. The Church upholds and proclaims her painless childbearing as witness to her virginity and the Divinity of her Son, and the freeing of the world from the dialectic of pleasure and pain. There are many feasts of the Mother of God, commemorating the events of her life, her intercessions for us after her death, and her innumerable miraculous icons. Her most significant and solemn feast is certainly her Dormition which includes her bodily Assumption, commemorated on August 15th and preceded by two weeks of fasting. The feast is often known as the “summer Pascha,” and is celebrated with great pomp throughout the Orthodox world. For instance, in Jerusalem on August 12th a Liturgy is served at Little Gethsemane, followed by a Molieben and a procession with her burial shroud to her sepulcher in Gethsemane proper, in which all the members of the Russian Spiritual Mission participate. On the morning of August 14th the clergy, monastics, and faithful embark upon a two-hour procession from the Jerusalem Patriarchate which culminates in the service of Lamentations at the Gethsemane Skete, where is placed the burial shroud of the Mother of God amidst fragrant flowers and myrtle and adorned with precious coverings. On the Apodosis of the feast (August 23rd) the burial shroud is returned in another solemn procession. This is but one of the celebrations throughout the Orthodox world that could be described that demonstrate the great love for the Theotokos that resides in the hearts of the Orthodox faithful. Following the resolution of the Nestorian controversy in 433, public veneration of the Theotokos in liturgical and artistic settings took on greater importance and spread rapidly. Several churches and monasteries were built in her honor in the fifth century, and she was celebrated throughout the whole empire on a day before or after the Nativity since the late fourth century. The ancient Armenian lectionary from Jerusalem compiled between 412 and 439 lists the commemoration of the Mother of God on August 15th in the Church of the Kathisma, and the feast was made obligatory in the East as a celebration of her Dormition by Emperor Maurice (582-602). Interest in the death of Mary existed in Palestine by the late fourth century, possibly connected with the tradition surrounding her tomb in the Kedron Valley. An early witness to this interest is St. Epiphanius of Salamis, and his words are surprising. He writes, “nor do I say that she remained immortal; but I also will not say definitively that she died. For the Scripture goes far beyond the human mind, and has left this point undecided because of the surpassing dignity of that vessel [of God] …” and “If the holy Virgin died and was buried, her falling-asleep was honorable and her end holy; her crown consisted in her virginity … Or else she remained alive; for it is not impossible for God to do whatever [H]e wills. In fact, no one knows her end.” This ambiguity is compatible with the Roman Catholic dogma of the Assumption of Mary which was proclaimed on November 1, 1950 by Pope Pius XII and states: “the Immaculate Mother of God, the ever Virgin Mary, having completed the course of her earthly life, was assumed body and soul into heavenly glory” (emphasis added). Following this intentional ambiguity, Roman Catholics are free to believe that she died, or not, but it is clear that by the time of Emperor Maurice’s decree the feast was universally understood to include both her death and Assumption, and this is the unquestionable understanding of the Orthodox Church. There is a long and complicated development of the traditions surrounding the Dormition and Assumption of the Theotokos. For most scholars the earliest extant witness to the story is found in a group of Syriac fragments dated to the late fifth century which describes the death of Mary, the reception of her soul by Christ, and the placing of her body in Paradise underneath the tree of life. There are also two Greek accounts from the late fifth or early sixth century, one attributed to St. John the Theologian, which expand on the Syriac account and include many of the details officially adopted by the Church and presented in the hymnography for the feast of the Dormition and in the Synaxarion. There is also a passage in On the Divine Names by St. Dionysius the Areopagite that speaks of the Apostles gathering to gaze at the body that was the vessel of God. Scholars consider this a pseudepigraphal work from late-fifth-century Syria, but notable Orthodox voices such as Fr. John Romanides and Fr. Dumitru Stăniloaeupheld the authenticity of the writings, meaning there could actually be a first-century reference to the Dormition of the Theotokos. Following these fragments and disputed works, the oldest extant Greek homily for the feast is that of John of Thessalonica who served as metropolitan between 610 and 649, and the roughly contemporary sermon of the Palestinian bishop Theoteknos of Livias. There are several other well-known early homilies on the Dormition by St. Modestus of Jerusalem, St. Andrew of Crete, St. Germanus of Constantinople, St. John of Damascus, and St. Theodore the Studite, among others. Through the hymns for the feast of the Dormition and the Synaxarion the Church depicts the story of Mary’s passing from this life and her translation into Heaven. Having asked to be given notice of her coming repose, the Archangel Gabriel appeared to the Mother of God three days prior, announcing her coming sleep and handing her a palm branch from Paradise which indicated that in death she would overcome corruption. Rejoicing at the news she went to pray on the Mount of Olives, where even the trees bowed in reverence to her. She then returned home and prepared herself for her burial. Her friends lamented that they were losing her but she assured them that she would continue to pray for them and the whole world. Suddenly there was a noise like thunder and her house was filled with the Apostles who had been miraculously gathered from around the world to bid farewell to the Theotokos – all except for the Apostle Thomas. Having taken leave of all present she prayed to Christ for peace throughout the world and gave up her holy soul to her Son and God Who had appeared with the Archangel Michael and a host of angels. According to some texts, Christ personally received her soul because she had prayed that He would protect her from the aerial toll houses. As was her childbearing, her death was painless. As the Apostles carried her bier in procession and sang with the angels the Jews became enraged and the priest Jephoniah attempted to overturn her bier but his hands were cut off by the sword of divine wrath. The sight of his severed arms brought him to repentance and he was healed by St. Peter. The Apostles buried her most pure body in the Garden of Gethsemane, remaining in prayer and hymning for three days. On the third day, a Sunday, the Apostle Thomas arrived, lamenting the fact that he had not been blessed to bid farewell to the Mother of God, and so the Apostles decided to open her tomb to allow him to venerate her body. However, they were astonished to find that her body was no longer in the tomb, and they realized that she had been assumed bodily into Heaven to be reunited with her Son as our advocate before God. As Christ appeared to His disciples, proving His Resurrection, so too did the Mother of God appear to the disciples as they ate, saying, “Rejoice. I am always with you.” Following the Lord’s Ascension whenever the Apostles ate they would remove a portion of bread for the Lord and lifting it up proclaim “Great is the name of the Holy Trinity! O Lord Jesus Christ, help us,” and each would partake of the Lord’s portion. However, this time they proclaimed instead “All-holy Mother of God, save us!” and ever since a piece of Panagia bread has been set aside in her honor. This custom is traditionally followed still today in Orthodox monasteries. The Apostles were then miraculously taken back to their respective mission fields. It should be noted that although the Orthodox Church has not formally proclaimed the Assumption of Mary as has the Catholic Church, it is no less an unwavering teaching of the Orthodox Church, as seen in its hymnographic, hagiographic, and Patristic literature. Thus the oft-made assertion that it is not dogmatic is problematic because it gives the false impression that the faithful Orthodox Christian can justifiably deny the Assumption of Panagia and fails to recognize the many avenues through which the Church proclaims the glory of Her truths. Her tomb in Jerusalem is indeed empty. This follows from St. Gregory’s statement that although the Lord has regenerated us through baptism and chrismation for the day of redemption “He has allowed us still to have a body which is mortal and passable.” This is a great mystery. Through Christ all corruption and death can be defeated within us, as it is in the Theotokos, and thus in some way our death becomes voluntary although it is according to the mortal nature we inherit at birth. But the death of the Theotokos, which is the culmination of the Biblical story of redemption has ushered in the experience that all men have been called to since the creation of Adam and Eve. Had they not sinned, Adam and Eve and all their descendants would have acquired immortality, and so she who is All-Holy, the Panagia, could not be held by the tomb. And we do not say that Christ simply chose to raise her body, but rather that death itself could not hold her. St. John of Damascus asks, “How could death swallow [the Virgin]? These things are alien and forever foreign to her God-bearing soul and body.” Noting its embarrassment at the hands of Christ, St. John also states that death approached the Theotokos with trepidation: “It learned from its mistake.” Her painless death and Assumption into glory are a confirmation of the saving work of Jesus Christ, and her passage is the first of that of which all of redeemed humanity will partake. The Theotokos is the greatest advocate of men before God. It is to her that we flee after God Himself and her petitions fill our services and prayers. She is truly the mother of the Church and her abundant love overflows on us all. At the wedding at Cana she interceded before her Son, her last act on earth was to pray for peace, and she continues in this role in an inestimably greater capacity now that she is body and soul in heaven with Christ. This is a continual theme in Patristic Dormition homilies. It is treated by St. John of Thessalonica, who teaches that Christ has mercy on those who praise His mother, Theoteknos of Livias, St. Theodore the Studite, St. John Maximovitch, etc. She is especially praised in this capacity by St. Germanus of Constantinople: “In times of tribulation you are near, and we find safety in seeking your help; and when it is time to rejoice, you are joy’s sponsor. Whenever we find ourselves completely under your maternal care, we cannot help believing that you live among us … every faith-filled heart runs towards you … every right-believing Christian bears you on his lips.” He even conceives of her as the central channel of grace: “no one is saved but through you, Mother of God; no one is free of danger but through you, Mother of God; no one is redeemed but through you, Mother of God …” St. John of Damascus writes that through her entry into Heaven she has won for us all good things, and St. Gregory Palamas writes that she forevermore bestows her blessings upon all of creation, as she promised just before her repose. It is true that there has been some disagreement on this issue. St. John Chrysostom sees ambition in her at the wedding at Cana, and vanity when she comes to see Him as He preached, and both Origen and St. Basil interpret St. Symeon’s sword as doubt piercing her heart at the foot of the Cross. However, St. Basil immediately asserts that she conquered such thoughts through heroic struggle. The economy of salvation is a mystery as is the role of the Theotokos, as we have seen. The Church had to internalize and ponder this great mystery, and having done so undoubtedly proclaims to us her complete purity. The majority of Saints boldly proclaim her purity. For example, St. Cyril of Alexandria says that “it is unseemly to impute any sin or transgression to the Virgin.” Furthermore, the rule of prayer is the rule of faith, and in the services we continually hear and proclaim Mary as our “most holy, pure, blessed, and glorious Lady,” and at the Vigil for her Entrance into the Temple we hear her described as “The glorious gate, impenetrable to evil thoughts.” These are but two of the innumerable examples that could be brought forth. chose to live in solitude out of the sight of all, inside the sanctuary. There, having loosed every bond with material things, shaken off every tie and even risen above sympathy towards her own body, she united her mind with its inclination to turn within itself, with attention and unceasing holy prayer. Having become her own mistress by this means, and being established above the jumble of thoughts in all their different guises, and above absolutely every form of being, she constructed a new, indescribable way to heaven, which could be called silence of mind. Intent upon this silence, she flew high above all created things, saw God’s glory more clearly than Moses (cf. Exod. 33:18-23), and beheld divine grace. Such experiences are completely beyond the scope of men’s senses, but they are a gracious and holy sight for spotless souls and minds. According to this testimony of St. Gregory, the Theotokos can be said to be the first hesychast. As we have seen, she again received immeasurable grace at her Annunciation which raised her to a new level of sanctification, and her painless child-birthing also sanctified her womb. She again received great grace at the foot of the Cross in order to bear the piercing of her soul by the pain of witnessing her Son’s unjust Crucifixion. She was the recipient of an abundant outpouring of grace from God, and she alone preserved herself blameless by preserving this grace. After Christ she is our example for the spiritual life, for she alone represents the fullness of redeemed humanity. The importance and centrality of the Theotokos in the Orthodox Church cannot be overstated, and she cannot be praised enough. She is our greatest example after Christ and she is the mother of the Church, ever interceding on our behalves before the Lord. Through His Incarnation the Lord Jesus Christ has deified human nature, and by extension it is by her obedience to the word of the Lord from the Archangel Gabriel that fallen human nature has been healed. Her womb became more spacious than the heavens for in it she bore He who is uncontainable. She is the Ark of the New Covenant and truly Theotokos. She alone has given God something He did not already have – His humanity. And she gave her entire life over to God and received inestimable grace, and she alone has preserved in full the grace she received, and this devotion is expressed through her Ever-Virginity of both body and soul. Her virginal childbearing was painless and thus destroyed the cyclical attack of pleasure and pain on mankind. Her complete purity in thought, word, and deed found its fulfillment in her painless Dormition, for death and the grave could not hold her who was above nature. Christ Himself took her soul into the safe recesses of Paradise, and her body was also assumed three days later. She is the confirmation of the saving work of Jesus Christ and the coming resurrection. As the Church confesses, she resides in the heavenly mansions and prays for all the world. The Mother of God stands at the very heart of our faith, and the entire Church venerates her above any Saint or angel. As Fr. Bulgakov wrote, it is the love and veneration of the Theotokos that warms our hearts and the entire Body of Christ. She seeks no glory or honor for herself but points us only to Christ Who is the Savior of our souls. and more glorious beyond compare than the seraphim. The statement is most commonly associated with St. Athanasius the Great (On the Incarnation 54.3), although the idea was previously put forth by St. Irenaeus and has been repeated down through the centuries. St. Hesychios: “The ark of Thy sanctification is the Virgin Theotokos surely. If Thou art the Pearl, then she must be the ark” (De S. Maria Deip., in PG 93, 1469). See also St. Romanos, Hymns, in Sources Chretiennes (Lyons), 110, 122-3; St. Andrew of Crete, Homilies in PG 97, 869C; and St. John of Damascus, Homilies in PG 96, 725; all referenced in Holy Apostles Convent. The Life of the Virgin Mary, the Theotokos. Buena Vista, CO: Holy Apostles Convent, 1989, p. 468. The exact identification of shittim wood is debated, but it is typically identified with acacia wood. In any case it is certainly a rare wood. Taushev, Abp. Averky. The Apocalypse in the Teaching of Ancient Christianity: an Orthodox Commentary. Trans. Fr. Seraphim Rose. Platina, CA: St. Herman of Alaska Brotherhood, 1995, p. 178. The issue of her painless childbearing will be further addressed in this work. Sermo ad noct. Resurr., ed. Lamy, 1:534, quoted in Gambero, Luigi. Mary and the Fathers of the Church: the Blessed Virgin Mary in Patristic Thought. Trans. Thomas Buffer. San Francisco: Ignatius, 1999, p. 115. See also St. Ambrose, Exposito in Lucam 2.7, PL 15, 1635-36; St. Isidore of Seville, Quaestiones in Genesim 2.18, PL 83, 216 and Allegoriae 139, PL 83, 117. Virginity represents faithfulness on behalf of the people of God in the Old Testament, and conversely unfaithfulness is presented as impurity (see Jeremiah 18:13-15 and Ezekiel 23). This imagery is continued in the New Testament era. St. Paul writes to the Corinthians that it is his duty to preserve the “virginity” of the Church (2 Cor. 11:2-3), and in the Shepherd of Hermas the Church is presented as a virgin (4th Vision, chapter 2). Charitos, Minas. The Repose of Our Most Holy and Glorious Lady the Theotokos And Ever-virgin Mary and Her Translation to Heaven. Orthodox Christian Educational Society, 1963, p. 10, quoted in The Life of the Virgin Mary, The Theotokos, p. 501. Origen’s use is cited in Socrates’ Ecclesiastical History 7.32, although the genuineness of the cited text is debated. Nevertheless, Origen certainly accepts the idea if not the term. In his De Principiis 2.6.2 he writes “But of all the marvellous and mighty acts related of Him, this altogether surpasses human admiration, and is beyond the power of mortal frailness to understand or feel, how that … the Wisdom of God can have entered the womb of a woman, and have been born an infant, and have uttered wailings like the cries of little children!” St. Dionysius’ use of the term is referenced but not cited in Madeleine Cosman, Madeleine Pelner., and Linda Gale. Jones. Handbook to Life in the Medieval World. Vol. 3. New York: Facts On File, 2008, p. 331, as well as on several websites including his Orthodox Wikipedia entry: “Dionysius of Alexandria.” Orthodox Wiki. 4 Sept. 2011. Web. 11 Nov. 2011. <http://orthodoxwiki.org/Dionysius_of_Alexandria&gt;.. New World Encyclopedia indicates that Bl. Theodoret wrote in 436 of the Apostolic origin of the term: “Theotokos.” New World Encyclopedia. 29 Aug. 2008. Web. 8 Nov. 2011. <http://www.newworldencyclopedia.org/entry/Theotokos&gt;. Epistle 101, quoted in Quasten, Johannes. Patrology. Vol. 3. Allen, TX: Christian Classics, 198., p. 253. Epistle to the Ephesians 18. Epistle 101. St. Gregory made this assertion against the Apollinarian heresy that said that the Logos took the place of a rational human soul in Jesus. However, St. Gregory’s teaching also stands as a condemnation of Nestorianism. According to Archimandrite Vassilios Bakoyannis Joseph had been married to Salome, the niece of the High Priest Zacharias, with whom he had four sons: James, Joses, Judas and Simon, and daughters including Salome, the mother of St. John the Evangelist and his brother James. Thus James and Judas are known as brothers of God. Bakoyannis, Vasilios. The Mother of Christ: the Mother of God. Athens: Orthodox Book Centre, 2005, p. 31-32 n. 2. Besides those who will be addressed, see also Venantius Fortunatus, Carmina miscellanea 8.6, PL 88, 268; St. Leo the Great, Sermo 22.2, PL 54, 195-196; St. Peter Chrysologus, Sermo 117.3, PL 52, 521; Theodotus of Ancyra, Homily 5.1, PG 77, 1413A –B; St. Proclus of Constantinople, Homily 4.1, PG 65, 708C – 709B; St. Gregory of Nyssa, On the Birth of Christ, PG 46, 1133D – 1136B; St. Andrew of Crete, Sermon on the Annunciation, PG 97, 897; John Geometris, An Address on the Annunciation 12, PG 106, 821; Pseudo-Chrysostom, Sermon on the Theotokos 3, PG 69, 713. Sermon on Easter, PG 46, 601-604, quoted in Callinicos, Constantine. Our Lady the Theotokos. Trans. Fr. George Dimopoulos. Christian Orthodox Editions, 1987, p. 49. Ad Thalassium 61, in St. Maximus the Confessor, Paul M. Blowers, and Robert Louis Wilken. On the Cosmic Mystery of Jesus Christ: Selected Writings from St. Maximus the Confessor. Crestwood, NY: St. Vladimir’s Seminary, 2003, p. 131. It seems this service is of late origin and there is some controversy surrounding the extravagance of its poetic glorifications of the Theotokos. Fr. Serge R. Keleher, a Uniate priest, examines the service in Keleher, Fr. Serge R. “The Funeral of the Mother of God.” Looking East 12 (1977): 16-34, found at http://basilcrow.com/tmp/dormition-burial-rite.html. According to The Praises or the Sacred Order of the Holy Burial of our Most-Holy Sovereign Lady, the Theotokos and Ever-Virgin Mary printed by St. Tikhon’s Monastery in 1983 the Lamentation service is celebrated on August 17th at the Gethsemane Skete (as opposed to the 14th), and is celebrated on the 15th in the Lavra, presumably of the Kiev Caves. For the work of Fr. Dumitru and reference to Fr. John see the Oct. 13, 2009 entry on the weblog Mystatogy: http://www.johnsanidopoulos.com/2009/10/apostolic-authorship-of-corpus.html. The same blog also provides two articles by a Fr. John Parker: http://www.johnsanidopoulos.com/2009/10/genuiness-of-writings-of-dionysius.html. Daley, On the Dormition of Mary, introduction p. 12, 13. The dogma, proclaimed in 1854 by Pope Pius IX in his Ineffabilis Deus states: “that the most Blessed Virgin Mary, in the first instance of her conception, by a singular grace and privilege granted by Almighty God, in view of the merits of Jesus Christ, the Saviour of the human race, was preserved free from all stain of original sin”. Origen, Homilies on Luke 17; St. Basil, Epistle 259; St. John Chrysostom, Homily 21 on John, Homily 44 on Matthew; all but the Homily on John are referenced on the New Advent article on the Immaculate Conception at http://www.newadvent.org/cathen/07674d.htm. Theodotus of Ancyra, Homily 6.11 in PO 19, 329; St. Ambrose, De Virginibus 2.6-16, PL 16, 220-22, quoted in Gambero, Mary and the Fathers of the Church pp. 199-202; St. Augustine, De Natura et Gratia 36.42, PL 44, 267; St. Germanus of Constantinople, Homily 1 on the Dormition, PG 98, 345A; St. Andrew of Crete, Canon on the Nativity; St. John of Damascus, Homily on the Nativity 2, PG 96, 664B; St. Ephraim the Syrian: “Most holy Lady, Mother of God, alone most pure in soul and body, alone exceeding all perfection of purity …., alone made in thy entirety the home of all the graces of the Most Holy Spirit, and hence exceeding beyond all compare even the angelic virtues in purity and sanctity of soul and body . . . . my Lady most holy, all-pure, all-immaculate, all-stainless, all-undefiled, all-incorrupt, all-inviolate spotless robe of Him Who clothes Himself with light as with a garment . . . flower unfading, purple woven by God, alone most immaculate” (“Precationes ad Deiparam” in Opp. Graec. Lat., III, 524-37), quoted at New Advent http://www.newadvent.org/cathen/07674d.htm. Interpretation of Ode 1, Canon 1 of the Ascension, quoted in Ibid., p. 133. St. Gregory Palamas. Mary the Mother of God: Sermons by Saint Gregory Palamas. Ed. Christopher Veniamin. South Canaan, PA: Mount Thabor Pub., 2005, p. 47, quoted on the website of St. Tikhon’s Monastery: http://sttikhonsmonastery.org/sinlessness.html. Bulgakov, Fr. Sergius. Eastern Orthodox Theology: a Contemporary Reader. Ed. Daniel B.
Clendenin. Grand Rapids, MI: Baker Academic, 2003. Cosman, Madeleine Pelner., and Linda Gale. Jones. Handbook to Life in the Medieval World. Vol. 3. New York: Facts On File, 2008. Daley, Brian J., trans. On the Dormition of Mary: Early Patristic Homilies. Crestwood, NY: St.
MYSTAGOGY. 13 Oct. 2009. Web. 11 Nov. 2011. <http://www.johnsanidopoulos.com/ 2009/10/apostolic-authorship-of-corpus.html>. “Dionysius of Alexandria.” Orthodox Wiki. 4 Sept. 2011. Web. 11 Nov. 2011. Thought. Trans. Thomas Buffer. San Francisco: Ignatius, 1999. — Mary the Mother of God: Sermons by Saint Gregory Palamas. Ed. Christopher Veniamin. South Canaan, PA: Mount Thabor Pub., 2005. St. Herman of Alaska Brotherhood, 2004. Keleher, Fr. Serge R. “The Funeral of the Mother of God.” Looking East 12 (1977): 16-34. Knight, Kevin. “CATHOLIC ENCYCLOPEDIA: Immaculate Conception.” NEW ADVENT. 2009. Web. 13 Nov. 2011. <http://www.newadvent.org/cathen/07674d.htm&gt;. of Jesus Christ: Selected Writings from St. Maximus the Confessor. Crestwood, NY: St.
Virgin Mary.” ocafs.oca.org. Web. 6 Nov. 2011. <http://ocafs.oca.org/FeastSaints Viewer.asp?SID=4>. Quasten, Johannes. Patrology. Vol. 3. Allen, TX: Christian Classics, 1986. Schaff, Philip, ed. Nicene and Post-Nicene Fathers. Vol. 14. Peabody, MA: Hendrickson, 1994. “Theotokos.” New World Encyclopedia. 29 Aug. 2008. Web. 8 Nov. 2011. Theotokos and Ever-Virgin Mary. South Canaan, PA: St. Tikhon’s Monastery, 1983. St. Ephraim of Syria, Sermo ad noct. Resurr., ed. Lamy. Pseudo-Chrysostom, Sermon on the Theotokos 3, PG 69, 713. Another beautiful paper that brilliantly expounds the saving truths of the faith. Great work, Jesse! thank God I was able to have so many great books at my disposal!